I usually wear a dress or skirt for Visible Monday. I love skirts, especially, and find them so comfortable and easy to style. But a woman needs her jeans, too. I’ve been wearing and loving them for about 50 years. These dark denims are my current favorites. I love the cuffed hem, the mid-rise, and the slightly baggy fit (room for dessert). They’re courtesy of J. Jill, who make a number of comfortable, stylish jeans for women over 21. The white linen shirt (sim) was thrifted from Molly Mutt for a couple of dollars. And yes – here is my new love, my tuxedo jacket featured in last week’s Visible Monday. It looks good with everything, gosh darn it. Windy on the beach today, but I don’t mind a bit. I’m wearing my leaf pendant (sim) and faux-zebra belt (sim) to complete my look. With and without my tux jacket; un-tucked (a little boxy) and tucked (better). I think you and I are channelling each other’s taste in jeans. These are perfect. I love that comfier jeans are coming back into style again. Ever since I split my beloved Rag and Bone skinny jeans when I was in Italy, I’ve been a little trigger-shy about skinnies. Jeans, a white shirt and a blazer is such a fabulously classy combination! You look great Patti! I really like you in this classic jeans style, Patti. The zebra belt is a lovely touch. love that jeans on you! Patti, so unsurprising that you’re wearing the tux jacket again. You’ve styled it so well with jeans too. I especially love that you can hit the dessert buffet in these pants. Hahaha! Thanks for the party, as usual. Hostess with the mostess. GAH….I LOVE your look Patti! I could just say ‘ditto Glenda’ because she’s spoken my thoughts…classic with just that little touch of the unexpected. And the proportions are perfect for you! Dark denim – a fail safe for every wardrobe! And a dark wash denim looks so effortless when paired with a white shirt and tux. Great touch with the belt. I knew the jacket would be nice on jeans. Great belt you added. I have uploaded two totally different looks with jeans. And of course linked back. Love love love this look! So cute with the cuffed jeans. So chic paired with a white shirt and blazer! You look fantastic as always! I love this classic look on you Patti, the crisp white shirt and the black blazer. Now, the jeans look great on you, I think dark denim looks so dressy and stylish! You’re right, a woman does need her jeans. And I forget we don’t see enough of Patti in these wonderful jeans. They look so great on you and I don’t know about you but I think they’re so easy and fun to wear. I don’t own any jeans but that’s not to say that i don’t love them on other women, you included! love the denim!! very chic with that shirt and the blazer, I like the tucked version! Definitely shows your nice figure! Definitely one of my fave looks of you Patti – Have a lovely week ahead! Love a good jacket with jeans and the tux jacket was made to be paired with denim! I never wear jeans as you know, but you look fabuous in them. I am different to you all – I don’t wear jeans! Actually, I never wore trousers (pants) until a few years ago as I was a skirts/dresses only person. So as for jeans wearing you never know…….!! These jeans look great on you and I love wearing looser fit jeans too. Patti’s wearing jeans!! I know you don’t wear them very often, but when you do, you do it right. The white shirt and tux jacket are classic and cool, and you rock them! What a classic look Patti. That black blazer pulls it all off. So sharp! Such a classic and classy look, Patti! Love the men’s shoes with it. Thank you for hosting, my dear! I’m terribly jealous of that amazing tuxedo jacket. This whole look is so chic. I adore the animal print on the belt. Looking fab in your jeans, Patti! You are styling in this classic look!! Thank you for hosting..
Fabulous outfit, Patti. Love every piece you’re wearing. You never make one wrong move. All my life I had hated (on myself) and would never wear a dark wash jean. (I was weird and had no style sense. haha). Now the dark wash are my very favorites. Love this outfit, Patti! And I love to wear it myself! Thanks for the link up! You’re a classic head to toe, Patti. Tux, white shirt, jeans and oxfords. Whoa! Great look! 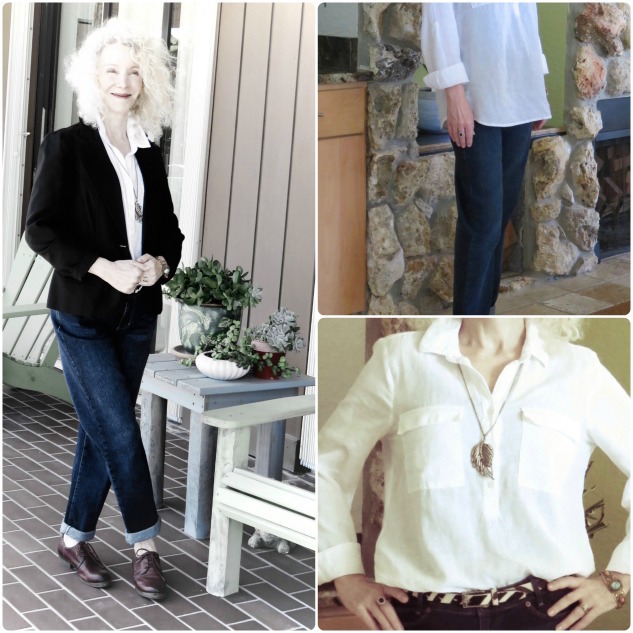 Great jeans, a white shirt, & a great blazer – what more do you need? 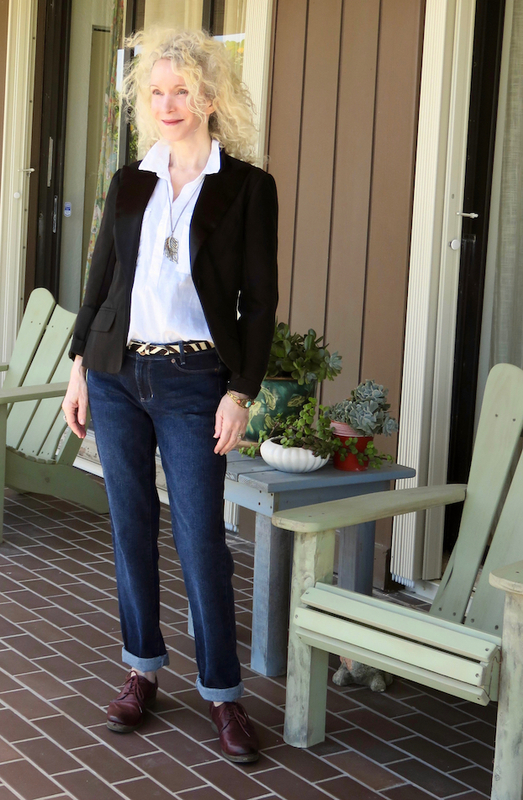 Nothing quite like a black blazer and crisp, white blouse with jeans! You look fantastic!! Thank you for hosting, hope you’re well! Perfect classic pieces! Love it, Patti. Loving the jeans with this jacket!! Such a chic, classic look. The tuxedo jacket looks as if it was meant to be paired with these jeans. You look fabulous in this, most probably the ultimate in casual chic Patti. Nothing beats & great fitting pair of jeans paired with a classic white shirt & black blazer – love it! Great look, Patti. There’s nothing like a good tuxedo jacket! A quintessential classic look, Patti. The deep blue denim, combined with the black blazer and crisp white button-down always work perfectly together. Love the little unexpected element of the belt.